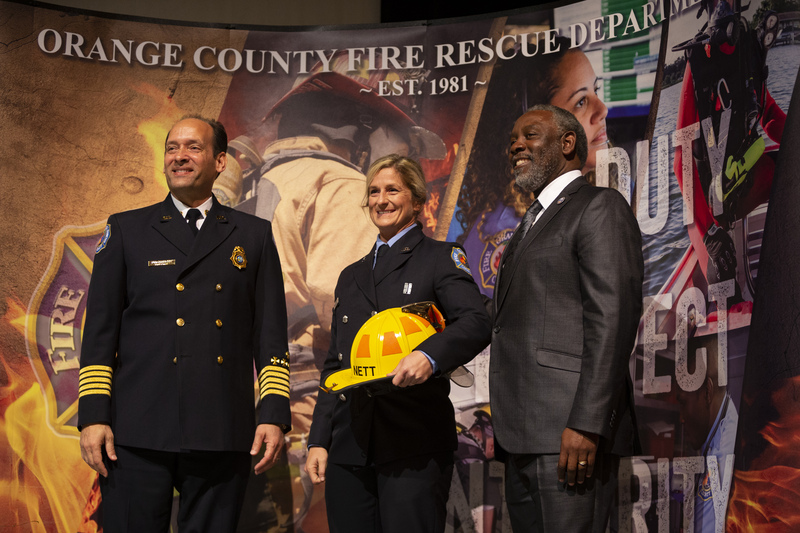 The Orange County Fire Rescue Department (OCFRD) swore in Class 84 on Jan. 11, 2019, the third and final class in a series of three which included the highest number of women firefighters on record. The final graduation was part of an unprecedented 2018 recruitment and training effort that ultimately produced more than 120 new firefighters for OCFRD, the 23rd busiest fire rescue department in the nation. With new fire stations opening, and additional stations on the horizon, the training efforts were in direct response to the growing community and the increased demand for fire and emergency medical services. Class 84 graduated nine women and 32 men. The new recruits will push the average of women firefighters at OCFRD above its current standing of eight percent, which is double the national percentage of women in the fire service. Physical standards and qualifications do not vary among men and women firefighters. Of the nine women to enter the program, all nine are primed for success. “There’s no modifier in real life. In an emergency we all must be able to perform certain physical rescues,” graduate Sara Bennett, age 36, said. Several of the recruits were drawn to Orange County for the opportunity to participate in some of the more unique programs at OCFRD, such as the special access climbing and dive rescue teams. Others are legacies, meaning that they are now the second and third generation of firefighters in their family. The Jan. 11 graduation drew praise from Orange County Mayor Jerry L. Demings and Fire Chief Otto Drozd III, who both recognized the hard work and accomplishments of the recruits over the past nine months. Mayor Demings provided the keynote remarks and welcomed the new firefighters into what he considers one of the strongest and most elite public safety families in the nation. As a law enforcement officer for nearly four decades, he pledged his continued support for them. In addition to the number of women graduating, Class 84 was recognized for its diverse background, which included several athletes, a former teacher, a stay at home mom, and even a recruit from South Africa who came to the United States for greater opportunity. “The face of the firefighter is changing, this class is an illustration of that progression. While all unique, each of them were required to surpass the same expectations, regardless of age, gender or background. Together they persevered.” Chief Drozd III said. Combined, more than 2800 candidates originally expressed interest in the three 2018 fire rescue recruit classes. Chief Drozd and Deputy Chief James Fitzgerald personally interviewed over 200 final candidates prior to their selection. “To run three training classes almost simultaneously was a tremendous undertaking, but produced rewards beyond measure for this community. Mark my word, these men and women will make a difference. I could not be more proud of the recruitment team, new firefighters, and their trainers,” Chief Drozd said.